The A.R.M.S.®® Stand Alone Flip-up sight, utilizes the same well proven concept as the rear sight on the SWAN® Sleeve system. 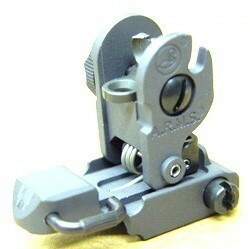 The unique design of the spring loaded rear sight, ensures constant battery action and repeat zero. The sight is held in the locked down position by a quick release lever, that prevents the sight from being accidentally engaged, but is as fast as a trigger to release even with arctic mittens. The initial elevation zero utilizes the standard M16/M4 front sight bead. When the sight is released into battery the 250-300 meter aperature is ready for immediate close combat use. For longer ranges the leaf sight aperature is rotated to access the 500-600capability with the built in horizon line feature that helps lead distant targets and lets the shooter square the rifle to counter windage offsets, if the rifle is inadvertently tilted.